Mrs. Lincoln's Inkin: Talking Tags!!!! How awesome is this!! Introducing Talking Tags from SU! Oh my goodness i am sooo excited about these adorable things!! With Talking Tag, you can send a gift that is uniquely you. 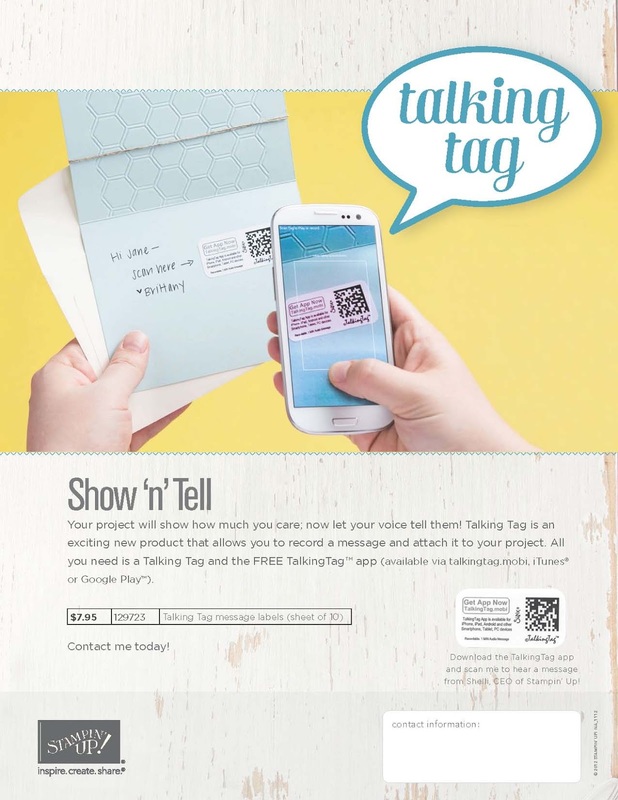 Talking Tag is a message label you can attach to cards, invitations, gifts . . . anything! Personalize birthday cards, Christmas gifts or even record quick instructions for a project. Now your pictures really can say a thousand words! You will have the opportunity to listen, re-record, cancel, or confirm your message after you've completed recording it. Each label allows up to 60 seconds of a greeting, song, or product message. Buy 'em by the sheet! You get 10 tags for just $7.95 (item 129723). How awesome are they right?!?! Well i hope you enjoyed today's announcement post! Until next time... Happy Inkin'! !